The Westport line was extended to Achill Sound in the 1890s. and this was one of the so-called 'Balfour Lines', called after Arthur J. Balfour, Chief Secretary for Ireland during the years 1887-91, who introduced the Act providing State assistance for the construction of narrow gauge lines to disadvantaged areas. The first station on this extension was Newport which opened in February 1894. 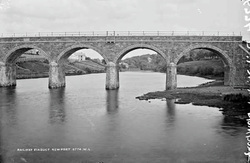 On of the most striking features of the Newport section of the line is the Viaduct which is featured in the picture on the left. Centre piece of Newport, the railway viaduct that once carried steam trains through Newport on their way to Achill, is now preserved as a walkway for native and visitor, to enjoy. It spans the Blackoak River, contains seven arches and cost £7,640 to build. The overall length of the viaduct is 305ft (92m) and the width 18ft 6in. The viaduct is constructed of local red sandstone with some limestone facings. The line was not opened until 1894 on completion of a nearby tunnel at the end of Newport Station.The first train crossed the bridge in February, 1894, and it was finally closed in September 1937.